This is Colony Collapse Disorder (CCD)—a maddeningly difficult-to-pinpoint phenomenon that has environmentalists wringing their hands, fundamentalist Christians predicting the rapture, beekeepers weeping, and farmers fretting over how they will feed the nation. One in three bites of the food that you eat comes from a crop pollinated by bees. Why all the apocalyptic rumblings and furrowing of brows? There is of course a monetary angle: commercial beekeeping is responsible for pollinating a huge percentage of the crops grown in this country—adding an estimated $15 billion to crop values each year. But there is also a far more human side. If agricultural figures seem abstract, try this: one in three bites of the food that you eat comes from a crop pollinated by bees. Bees may not be the cutest or cuddliest, but they are a bedrock of food crop production. Losing them would irrevocably damage the agricultural system we rely on every single day. Put simply: no bees means far less and much more expensive food. The main sign of CCD is a hive in which a queen is present, but there are few or no adult worker bees, with very few or no dead bees in the area. The abandonment of a queen and larvae is strange enough, but even more surprising is that hive pests—insects who usually move in on weak or undefended hives—steer well clear of colonies left abandoned by CCD. It’s as if they sense that something is very wrong with the free meal right in front of them. The trouble started in 2006 and quickly escalated. In the past year alone, beekeepers nationwide reported staggering losses of 42% of their hives. 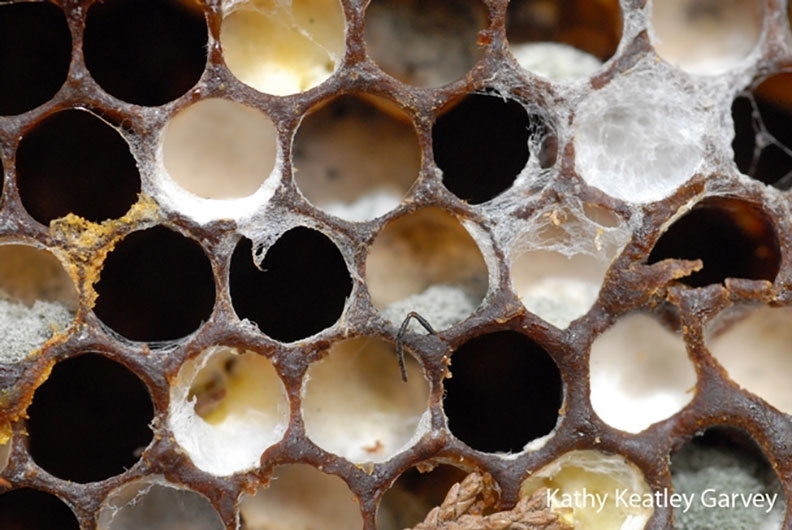 In some areas, keepers have lost up to 60% of their hives. A hive apparently abandoned because of CCD. ⓒ Kathy Keatly Garvey. In the face of the deepening crisis, the USDA and EPA have convened task forces, sponsored research, and consulted some of the brightest minds in entomology. The main goal is the most telling: figure out what is going on; only then can we hope to move forward. The answer to that is turning out to be not one factor, but a slew of them–each more murky and ill-defined than the last. Two factors top most people’s lists of likely culprits: pesticides and varroa mites. One of the most common subclasses of pesticides, called neonicotinoids, is an especially intriguing case. A recent study found at least one kind of neonicotinoid in 90% of honey in the US. But while it’s true that some affected colonies show high levels of those pesticides, other affected colonies show little to no sign of the toxins. It’s the same case for varroa mites. An invasive pest that showed up in the 1980s, varroa mites feed on bees’ blood, weakening the bees and transmitting other pathogens in the process. Some collapsed colonies are infested with mites, others are unaffected. But colonies that have been wiped out by varroa mites are often littered with bodies and CCD is known for the lack of bee bodies it leaves in its wake. If not varroa mites, perhaps some other pathogen? Here again, the evidence is conflicting. There is no common pathogen found among collapsed colonies, and many healthy colonies show signs of pathogens found in colonies that have suffered from CCD. But pesticides and pathogens are hardly the only things worth examining. Just like a doctor might inquire about your eating habits, researchers have also pointed a spotlight on the diet of commercial bees. American agriculture tends toward monoculture—meaning that a farm grows only a single kind of crop. If bees are pollinating that farm, they only have access to one type of pollen. A diet of only one type of food isn’t healthy for anyone, bee or human. Modern agriculture has also taken over huge tracts of land, splintering habitats and removing other potential sources of pollen and thus nutrition from bees. To keep them going between crop pollinations, many beekeepers have taken to supplementing their bees’ diet with artificial sugar solutions like high fructose corn syrup. 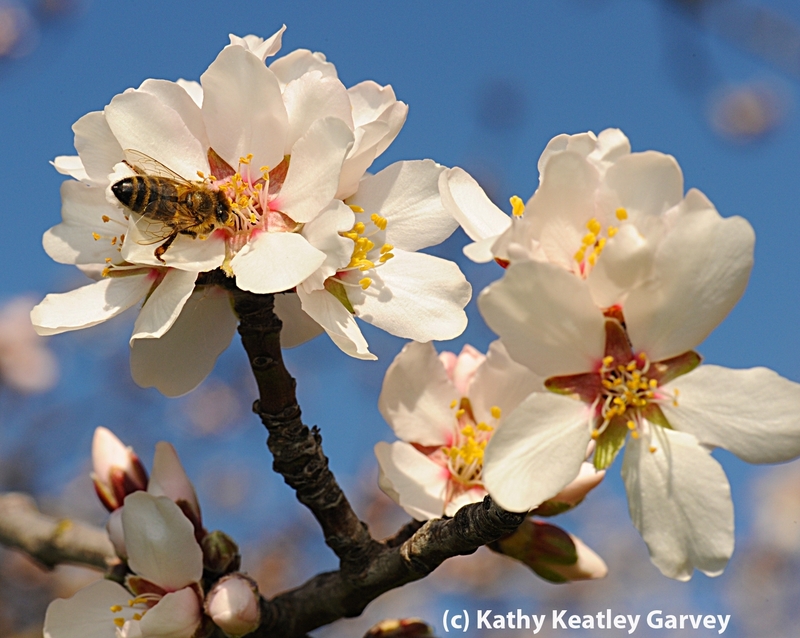 A honeybee pollinates an almond blossom. One of California’s most lucrative crops depends almost entirely on bee pollination. ⓒ Kathy Keatly Garvey. Then there is the practice of trucking hives from one farm to another. Bees are often transported long distances to pollinate crops like blueberries and, famously, almonds. This also shuffles bees from one kind of mono-diet to another. Only cranberries for one month, then only oranges for a few weeks, then back to artificial sugars. None of that can be healthy, but is it cause for CCD? In reality, the picture that is emerging is a complex one. More and more it seems that we’re dealing with a problem of multiplication—one factor which may be relatively survivable on its own becomes radically more threatening or fatal when combined with other formerly low level threats. In a recent study published in Science, a team found that exposure to pesticides seemed to make bees more vulnerable to varroa. They also found that poor diet seemed to correlate with an increased susceptibility to pesticides. Honeybees are stressed, and while we can’t pinpoint one cause, we can say that none of this can be good for bees. Bee friendly by planting flowers, shrubs, and herbs that bees are attracted to, like this hydrangea. 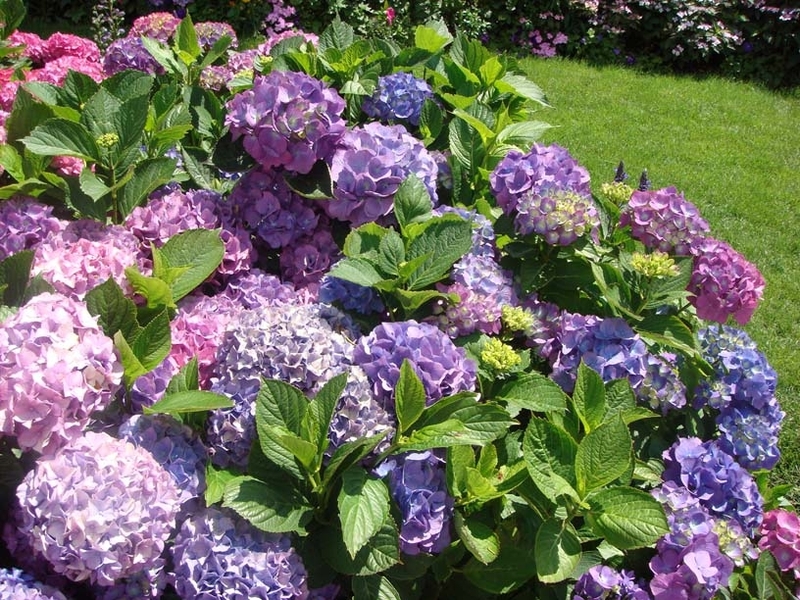 "Hydrangeas corner" Image ⓒ Ookwormbay7/ English Wikipedia. In practical terms, that means there is no simple solution; no one pesticide to ban, no one mite or fungus to spray for. Instead, the still elusive solution will most certainly have to be just as multi-factorial as the problem. But as Medalist and renowned biologist E.O. Wilson pointed out, “It would be a serious mistake to let even one species [of insect] out of the millions on Earth go extinct.” So while we’re still unraveling the complex causes and solutions to CCD, there is a simple action that everyone can take: plant a tree, bush, or flower that bees like. It will give wild bees more food and may even help to bring back some of the habitat they’ve lost to our civilization. It seems the least we can do for the insects that make possible most of the food we eat. "One day, my advisor said to me, 'You could get a Ph.D., you know, if you wanted.'" "The Bates Seven was a designation for seven undergraduates from New York University. I was one of them."